Was this Ohio man’s 1952 protest against women effective? Looking back: “Darn infernal women irk Ohio man” ran on the front page of the Record-Herald in the summer of 1952. What do you think about Norman Parker’s protest against women? In the summer of 1952 this Associated Press news story, “Darn infernal women irk Ohio man,” ran on the front page of the Washington Court House Record-Herald. Chesapeake, July 3, 1952 — (AP) — Norman Parker figures he has as much right to show his legs as women have. So he’s been wearing shorts—day in and day out—since 1935. The tall, raw-boned non-conformist lives in the hills back of this Ohio River village with his 75-year-old mother in a weather-beaten frame house. People in the hill country around Lawrence County have long been accustomed to Parker—and the shorts. A cold “spell” finds him donning an overcoat, gloves and a hat. But underneath it all, just the shorts. Parker, who says he hasn’t done a lick of work since he started wearing shorts, tells of the time the town marshal hauled him off to jail. Then there was the time he went to an open-air church meeting. His main hobby—roaming the hills for game and fish—takes care of some of the food problems at home. Three other sons help their mother. It has been 65 years since the publication of the article. What do you think about Norman Parker’s 1952 protest against women? Post your thoughts in the comments below. 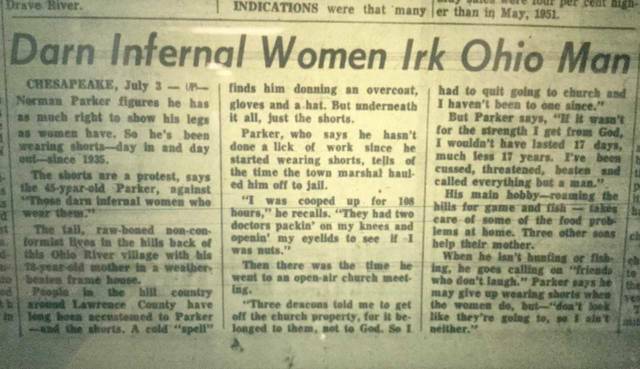 https://www.recordherald.com/wp-content/uploads/sites/27/2017/07/web1_InfernalWomen.jpgLooking back: “Darn infernal women irk Ohio man” ran on the front page of the Record-Herald in the summer of 1952. What do you think about Norman Parker’s protest against women?